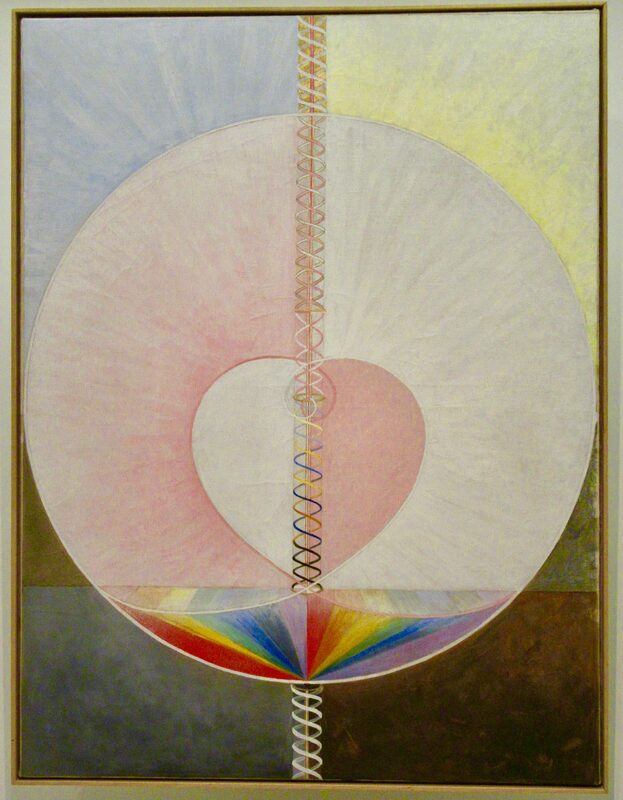 Hilma af Klint (1862 – 1944) was a Swedish artist and mystic whose paintings were among the first abstract art. af Klint often incorporated insights gleaned from color theory in her paintings, while endowing colors with unique symbolic significances. In The Dove (1915), a group that depicts the creation of matter from light, she used a combination that reoccurs in much of her work: blue and yellow. In the artist’s symbolic vocabulary, blue represents the female, and yellow stands for the male. Though the gendering of these colors was was specific to af Klint, that belief that these two colors represent an essential dichotomy likely derived from Johannn Wolfgang von Geothe’s Theory of Colors (1810), a book found in af Klint’s library. Photographed in the Guggenheim Museum as Part of the Exhibit, Hilma af Klint: Paintings for the Future, On View Through April 23rd, 2019.